As found by Dr Indy in the Edmonton Sun. Tracy is also rumoured to be close to coming to terms with a sponsorship deal that would see him race in the Indy Racing League at the Rexall Edmonton Indy in July for Derrick Walker Racing. Just so you know, there's nothing on the Walker Racing site that even remotely hints at an IndyCar series program. Yes friends, that means it's gotten so bad that Captain Crunch is now rumored to be driving for teams that don't really exist. Oh, how the mighty have fallen. UPDATE: Robin, breathlessly following the story, says Tony George is willing to commit a car to Tracy and Walker but ultimately it all comes down to finding sponsorship. "Paul wants to do it, Tony wants to do it and I want to do it so now we're trying to make it happen," said Walker, whose longtime open wheel operation has been idle since the Champ Car finale at Long Beach last April. "I've got a couple people in Canada up there pitching for us with about a dozen companies so hopefully we can come up with something in the next week or so." Cavin & Kevin talked about that very possibility (an Edmonton + Walker one off) on last week's Trackside. I say it'll get done, even if it takes some Tony-bucks. It'll make the race SO much more marketable locally. And IF it happens, what a great sign, that Walker's still working to put something together. It HAS to happen, if only to see Captain Crunch VS. The Princess of Pout in a no-holds-barred four wheeled 'rasslin match on the mean streets of Edmonton. C'mon, who here @ My Name is IRL.com wouldn't pay to see the aftermath of a Paul "The Crazy Quebecois" Tracy - Danica "Romper-Stomper" Patrick wall banging incident? Put Derek Daly in the booth to call it and it's FULL OF WIN!!!!!!!!! "Ooohhhh, and it's Danicker with a well placed foot to Tracy's shin! Paul's not gonna like that." It would be a good marketing move for the IRL, absolutely. Tracy brings instant personality. Too bad he's still holding out for a quality ride ... I'm sure him and Penske/AGR/TCG are THAT close to making a deal. Too bad he's still holding out for a quality ride ... I'm sure him and Penske/AGR/TCG are THAT close to making a deal. I hear the sticking point is since Dixon gets free lamb for life for winning the Indy 500, Tracy is holding out for free tenderloins for life. 'Cause you know, he's not racing for hamburgers and hot dogs. Paul Tracy decked out in Monster Energy apparel today, appearing on ESPN2's NASCAR Now. He was interviewed by Nicole Manske. He gave his usual spiel about being able to run in NASCAR. Also said that within the next few days, Walker and everyone else involved would decide whether to run Edmonton or not. 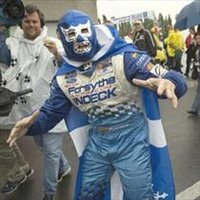 Paul Tracy: Don't need him, Don't want him.